Here’s how to claim the doctor title and not go through eight years of med school—become a pet dentist! We also realized how necessary pet dental health is after learning the hefty expense a pet root canal can be. 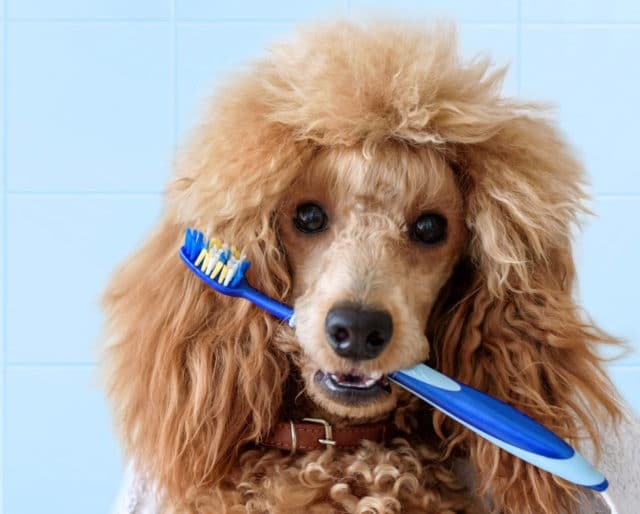 Yes, we just said “pet root canal.” While it’s comical to think of our pets in place of ourselves at the dentist, their dental hygiene is just as crucial as our own. That’s why we spend some extra love on their teeth during February — Pet Dental Health Month! Veterinary Oral Health Council was started in Denver, Colorado, in 1997. The Chinese practiced dental maneuvers on horses as far back as 600 B.C. The American Veterinary Dental College, the first of its kind, was founded by eight veterinarians. Get your pet the care it needs from a Veterinary Dentist. Pick up at home supplies to maintain your pets dental health all year round. The dentist can be overwhelming — buy your pet a treat to say "good dog!" Loving our pets means taking care of them and their health. Taking proper care of dental health means taking care of bad breath. Poor dental health can lead to larger scale health problems in animals.